Window regulators are used for lifting and lowering of windows and enable these to be held in any position. In older vehicles, mechanical window regulators are installed and these are operated by a window crank. In new vehicles, powered window regulators are increasingly used, which are operated by an electric motor. The window regulators are individually operated by a switch on the cabin panel. By means of a control unit for electrical window regulators, so called “comfort functions” can be set up. These include the automatic raising and lowering of the windows by a short press on either the switch or the coupling of the window regulator function on the central locking. For the manufacture of window regulators with a scissors control mechanism of the DT® Spare Parts brand, galvanised sheet steel is used. This way, optimal protection against corrosion is achieved. Production is carried out using stamp-bend technology, in which stamping and bending are combined during the production process. This construction process ensures a high degree of form stability. 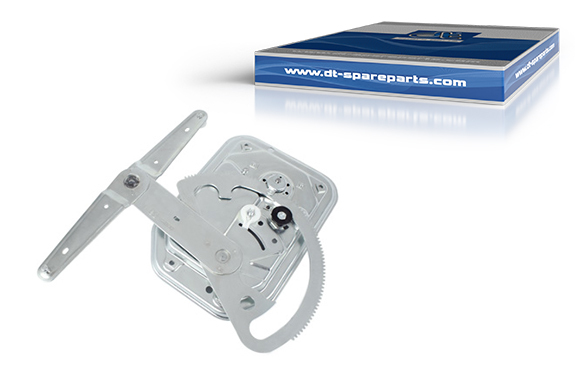 The DT® Spare Parts brand offers various forms of window regulators. In the case of cable window regulators, a cable drum is moved when the window regulator is operated. Both ends of a steel cable are fastened to the drum. When rotated, one end of the cable is wound up and the other end unwound. The cable pulls the window mounting up or down over a Bowden cable and a guide pulley. The cable end without tension is simultaneously rewound onto the drum. Another way to move windows is the scissors principle. Here, the window pane is moved by two lifting arms arranged in the form of scissors. The lifting arms are moved over gears, which are operated by hand window crank or driven by electric motors. When the lifting arms are in the closed position, the window pane is pushed into the uppermost position. When the scissors open, the pane glides downwards. The gearing is subjected to high forces and, therefore, must be particularly strong. Only high-quality and high-strength materials are used in the production of window regulators of the brand DT® Spare Parts, in order to guarantee a long service life. To ensure perfect power transmission, the motors are equipped with a high-strength, sintered gear wheel. Window regulators of the DT® Spare Parts brand are characterised by a high-quality finish. Accurate spot welds and precise riveting during the connection of individual components ensure perfect functioning over long periods of time. The sliders on the ends of the lifting arms are made of high-strength, low-wear plastic. The sliders of the DT® Spare Parts brand have a special fit. This ensures a firm seating while, at the same time, the ball socket can move freely the ball head. The precisely pressed attachment points, which are in part equipped with a screw thread for problem-free screw fitting, ensure easy assembly. With window regulators of the DT® Spare Parts brand, polarity reversal is excluded, due to secure plug connections, which are tested for perfect fit. In addition to complete window regulators, the complete range of the brand DT® Spare Parts also offers all standard accessories.